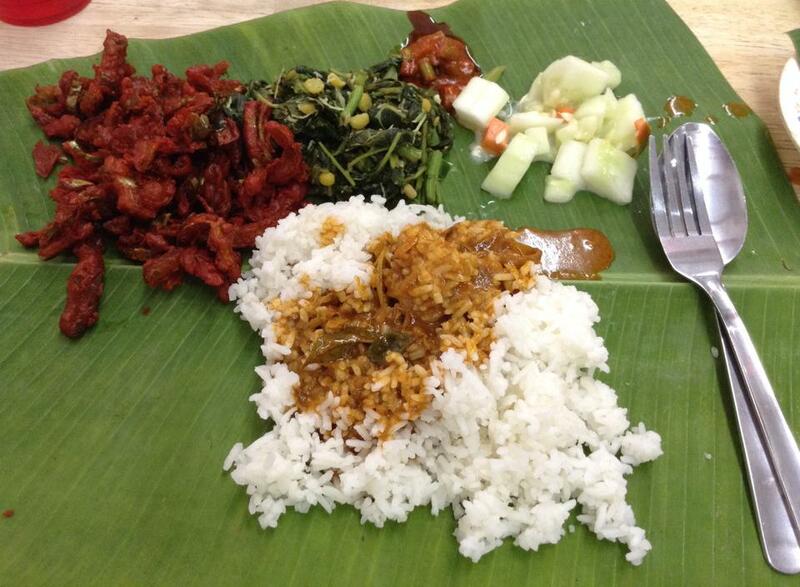 Ever craved for that perfect plate, or should I say, leaf, of one of Malaysia’s most popular Indian dishes, Banana Leaf Rice? Here at The Food Surfer, we aim to bring you the best of the best locations to satisfy your tingling taste buds, and this week, we shall be taking a look at Restoran Nirvana Maju in Bangsar. Located in the very heart of Bangsar, just across the popular shopping centre Bangsar Village II along Jalan Telawi, Nirvana Maju is regularly frequented by people of all walks of life, celebrities and even foreign expatriates from Western countries! It was also featured in Malaysian YouTube celebrity JinnyboyTV’s video, “More Than Words”. The restaurant is usually packed with patrons – especially during the lunch hour – so make sure you come early to get a spot! 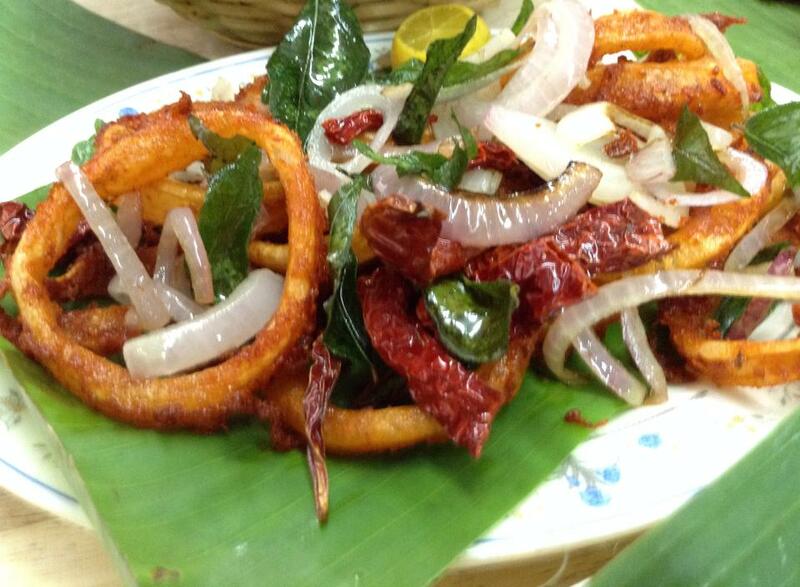 Nirvana Maju serves typical South Indian cuisine as well as popular Malaysian delights. As mentioned above, its specialty is the vegetarian Banana Leaf Rice which is the usual lunch dish and you may also have the option to order an extra side dish like Ikan Tenggiri Goreng, Ayam Goreng, Mutton Massala or Sotong Goreng. Other condiments include dried chili and Acar, a spicy bean dish. This time round, I had my usual vegetarian set with the Tenggiri, Ayam Goreng and Sotong Goreng. This meal never fails to satisfy me and my ravenous appetite. The set comes with 3 vegetarian dishes, rice, pappadam and a generous serving of any curry you like. One of the highlights is the fried bitter gourd, which is one of the vegetarian dishes included with the set. Unlike many other Indian restaurants that serve this dish, surprisingly, Nirvana’s bitter gourd is actually not bitter; in fact, it is sweet. They do this by coating the bitter gourd with a form of red batter and then deep frying it at high temperatures, producing crispy goodness. This bitter gourd locks its sweet and slightly bitter taste within its crunchy shell which is moist and provides much enjoyment when consuming it with fish curry or better known as Kari Ikan. The other vegetarian dishes are usually a cucumber and spinach dish which, when consumed with a spoonful of hot white rice, is really satiating. The fried chicken or Ayam Goreng is delectable with its level of crispiness. This is achieved by deep frying the chicken in oil heated to solar temperatures. This method of deep frying locks all the moist chicken taste within its outer skin and gives you a crunchy sensation when chewed upon. However, the crisp exterior might not appeal to some as it does sometimes taste rather dry and smoky. The fried fish or Ikan Tenggiri Goreng is absolutely heavenly, especially when consumed with some lime juice squeezed on its surface. 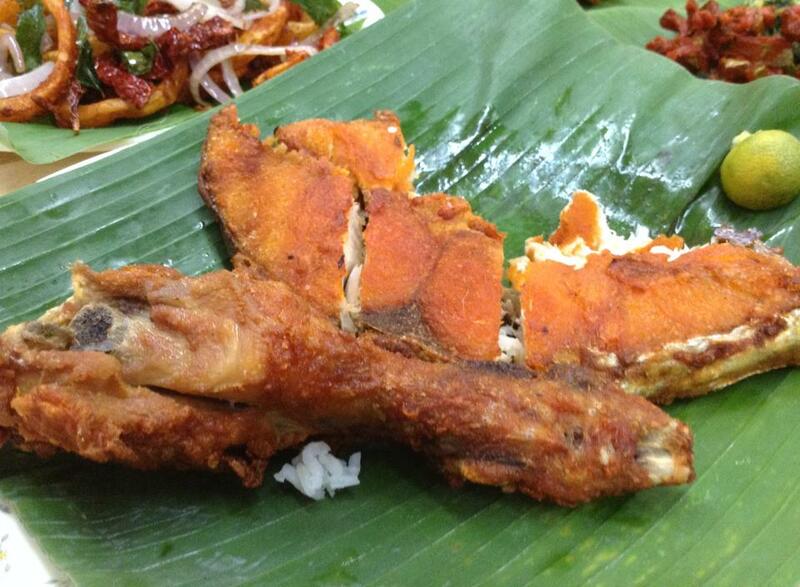 The inside of the fish is soft, white and moist while the outer part is evenly fried and crispy; it is not dry at all. You might even find it hard to eat as the inside is really hot, especially when it is freshly fried. I must say that Nirvana really outdoes other shops as the serving of fish is quite large for its reasonable price of RM8. 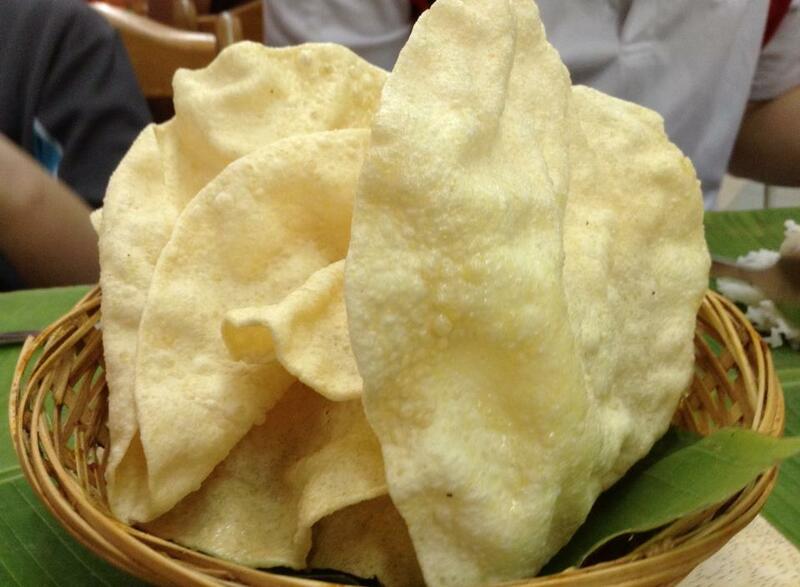 I enjoy eating my Tenggiri with a ball of curry-coated rice, scooped onto a piece of crunchy Pappadam. The Sotong Goreng or fried squid was quite disappointing this time, albeit its usual remarkable taste. Usually, it comes deep fried in the very same red batter used to fry the bitter gourd and the squid had a nice tender and firm texture; but for unknown reasons, the squid was rather jelly-like and tasteless this time. If you’re not fond of Banana Leaf Rice, Nirvana also holds many other localised delights such as Maggi Mee Goreng and Briyani which are equally as smashing. Topped up with an ice cold glass of Sirap Limau Ais, any meal in Nirvana Maju is a gastronomical adventure. The standard vegetarian set will set you back by only RM8 while the add-ons range from RM5 – RM10. So, if you’re in the mood for some really good Indian cuisine, do stop by Nirvana Maju in Bangsar! Their Banana Leaf Rice is probably the best I have ever eaten! >The author is a food junkie, typically fond of Indian, Japanese and Western food. Well, he’s pretty much fond of everything! He never fails to have his dosage of BLR at least once a month. Besides eating, this author also enjoys filmmaking and posting his latest works on YouTube. Do check him out at XAnonymousProduction on YouTube!